Mangos are an amazing fruit. Touted as a super fruit they have so many health benefits and are full of Vitamin C, Vitamin B6, Potassium, Copper and Vitamin A. They originated in southern Asia in the area around Burma and eastern India where they were cultivated for over 4,000 years. Known as the “king of the Fruits”, today they are grown throughout the tropical world, with more than 1,000 different varieties available, ranging in color from greenish, yellowish to reddish, often tinged with purple, pink, orange-yellow or red. The health benefits of mangoes have long been known in these areas, now the rest of the world is catching on. 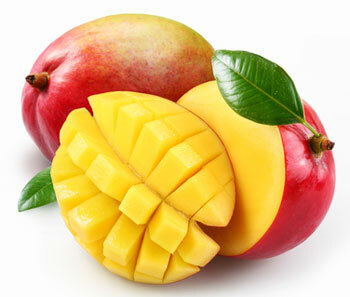 Mangos are one of the most nutritious fruits you can eat. With more than 20 different vitamins and minerals, they are low in fat and free from cholesterol and sodium. Did you know that one cup of mangoes will provide you with 100% of your daily vitamin C requirements, 35% of your vitamin A and are a rich source of fiber and potassium. They also contain flavonoids like beta-carotene, alpha-carotene and beta-cryptoxanthin. As well they are rich sources of minerals, such as copper, potassium and iron and contain traces of minerals such as magnesium, manganese, selenium, calcium, zinc and phosphorous. The vitamin C in mangos plays an important role in promoting a healthy immune system as well as collagen formation, aiding tissue growth and repair and protecting the body from infection. While the vitamin A is important for vision, bone growth and healthy skin. The Beta-Carotene in Vitamin A, is a powerful antioxidant that slows down the aging process, improves lung function, reduces complications associated with diabetes and reduces the risk of certain forms of cancer. Mangos are high in fiber, which is important for weight loss, maintaining a healthy digestive system and reducing the risk of certain forms of cancer. Mangos have also been found to be rich in iron which makes them beneficial for pregnant women and those suffering from anaemia.